Kenneth Williams was as literary as his erudite excursions on Just A Minute might suggest, his fabled diaries being swiftly followed by a volume of his letters (both edited by Russell Davies) in the years 1993-4. But, for nigh on the last 15 years Kenneth Williams fans have had to be content with these hugely enjoyable volumes. Until now. The story of how former DJ Wes Butters came to acquire much of the material that forms Kenneth Williams Unseen is remarkable in itself, consisting as it does of the vagaries of Fate combined with a knowledgeably inquisitive mind. The upshot of Butters’ internet surfing is an intriguing if at times drifting volume of (as the title suggests) Kenneth Williams memorabilia that has never previously been published. To offset what might have otherwise been a rather thin coffee-table style book dealing with Kenneth’s death and at times unhappy life, Butters (assisted by Russell Davies) weaves a narrative gleaned from extensive interviews with those close to the comedian, helpfully detailed in a ‘cast of characters’ at the start of the book. The insight this offers is startling- the general consensus of opinion being, for example, that Kenneth did not commit suicide (as has been widely believed- see the clear implication in the reprinted Daily Mirror article on page 24). In fact, it is the highly contentious subject of Kenneth’s final hours that opens the book proper after a typically informative introduction by Russell Davies. The structure of Kenneth Williams Unseen is an interesting one, for it posits 9 chapters (= 9 divisions) of a life that could easily have been split into just five (early years, Army life, radio, films and television). Although the titles do not give too much away (‘The Man Who Taught Him Comedy’ for example), the contents help to flesh out the picture of a man made familiar by the familiar- gone are the usual portraits and hackneyed images that have been frequently reprinted and which have found their way onto souvenir mugs in rather dubious taste. Instead, to compliment copies of key documentation (such as Kenneth’s Will, passport and script extracts), a range of more unusual photographs (such as the on-set pictures from Carry On films, plays and even the Comic Roots programme) support the text. If anything, it is sometimes the use of the illustrative material that undermines the text (for example, the reference to 7 Keys To Baldpate that accompanies the script extracts on pp. 65-66 is unfortunate- the extracts belong instead to Alladdin [sic.]. Although the book is largely chronological, the illustrations are not. It is thus extremely disconcerting to find Kenneth talking to children on the streets in the 1980s (a superb colour photograph on page 99) closely followed by pictures from Some You Win from a similar time period before a lovely vintage Army group picture confronts the eyes on page 116. It is this which makes orientating oneself around Kenneth Williams Unseen a little like steering a ship without a map- you think you are probably going in the right direction but would welcome a landmark or two to confirm your assumption. However, to hold a charge of inept geography at Butters’ book would be churlish in the extreme. True, it is neither traditional nor conventional in its approach, but it is, like much of Kenneth’s work, a delightful pot pourri of visual stimuli and revealing insight. Perhaps the most significant thing about the comments that accompany many of the remarkable images are their anecdotal ordinariness. Thus, Eric Merriman’s account of a party (page 154) or Peter Rogers’ comment that Kenneth ‘couldn’t do two things at once. He couldn’t answer the phone and talk to you’ (p.214) are now captured for posterity. It is these words which help to create a more rounded portrait of Kenneth Williams- the comedian, the entertainer, the man. Kenneth Williams Unseen is a creditable addition to the Williams canon and also a volume of some detail (it runs to 276 pages including a thorough index). What the book does perhaps more than anything is keep the spirit of the man alive. In essence, it ultimately comes to resemble a visual This Is Your Life, but sadly devoid of its subject in the flesh to react in semi-outraged mock surprise as another unexpected memory from a past friend or colleague amuses the audience. The comments that are sprinkled in the ‘wit and wisdom’ section towards the end of the book are sometimes familiar, sometimes new- but always interesting. Kenneth himself commented that ‘I wonder if anyone will ever touch the things that were once a part of my life and ask themselves what manner of man I was’. Now, thanks to Wes Butters, we all have the opportunity to get as close as most of us will ever get to doing just that. 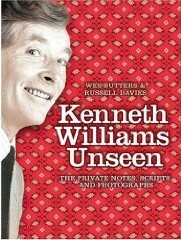 'Kenneth Williams- Unseen' is published by HarperCollins.